Find the Moon Amulet for Kharjo. Kharjo is a Khajiit caravan guard traveling with Ahkari. Due to the roving nature of his occupation he can be difficult to track down, but keep in mind that Ahkari's caravan makes stops just outside of Dawnstar and Riften. When speaking to Kharjo, he will remark that the caravan was ambushed by a group of bandits. Normally, the Khajiit are able to scare away this type of nuisance, but this time the bandits made off with his heirloom amulet. The amulet was given to him by his mother when he was a cub, and is the only thing to keep him warm in this cold land. When you tell him that you will retrieve it for him, he is appreciative of your desire to help, but will also say that it is not enough to lose your life over. He will then send you to the randomly determined bandit hideout. Acquiring the amulet will involve visiting the hideout in question. Track down, and either slay or sneak past its bandit inhabitants to take the amulet from the boss chest at the end of the dungeon. Return to Kharjo, but be aware that he may have moved or could be on the road while you are looking for him. Once you find him, Kharjo will be most pleased to have the Moon Amulet again. He will give you a leveled amount of gold and becomes a potential follower. When looking for Kharjo, a good strategy is to simply use the "Wait" function outside of one of the cities where his caravan stops until he arrives. 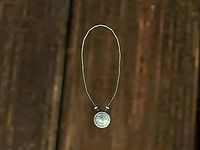 The Moon Amulet can be safely pickpocketed, looted, or traded from Kharjo after the quest. If the quest directs you to Broken Oar Grotto, Cracked Tusk Keep, or Frostmere Crypt, check to see if you have already visited these locations on your map. These locations do not respawn, so if you have been there before, the Amulet cannot spawn there and you cannot complete the quest. This bug is fixed by version 2.1.0 of the Unofficial Skyrim Patch. You will need to reload a previous save to get a different location from Kharjo. On the PC, it is possible to use the console to advance through the quest by entering setstage FreeformCaravansA stage, where stage is the number of the stage you wish to complete. It is not possible to un-complete (i.e. go back) quest stages, but it is possible to clear all stages of the quest using resetquest FreeformCaravansA. This page was last modified on 31 May 2015, at 09:42.